The coyote, Canis latrans, is a resilient species that thrives throughout North America. It is part of the Family Canidae, which include dogs, wolves, foxes, and jackals. Here in Michigan, the Eastern Coyote makes its home across fields, woods, and even our backyards. The coyote is a highly adaptable, intelligent, and pack-oriented animal that ranges in size from 22-41 pounds. Like wolves, the dominant pair of coyotes within a grouping will mate for life. Subordinate juveniles and adults are part of the coyote social structure often described as a “pack”, though it more closely resembles a family. Coyotes are considered carnivores. They are also able to digest plant material and other resources, though, so they are opportunistic omnivores (they will be drawn to human food waste and unattended pet bowls). In the past few decades, we have seen a sharp rise in wildlife predation, with the prey including neighborhood cats and dogs. There are several reasons for the increase, but much of it is due to loss of their habitat and human encroachment in former wild areas. Adaptive animals like the coyote have had to resort to using our spaces as their own, and they are surprisingly good at it. This means that we, too, must adapt to this new reality by understanding predator-prey animals. 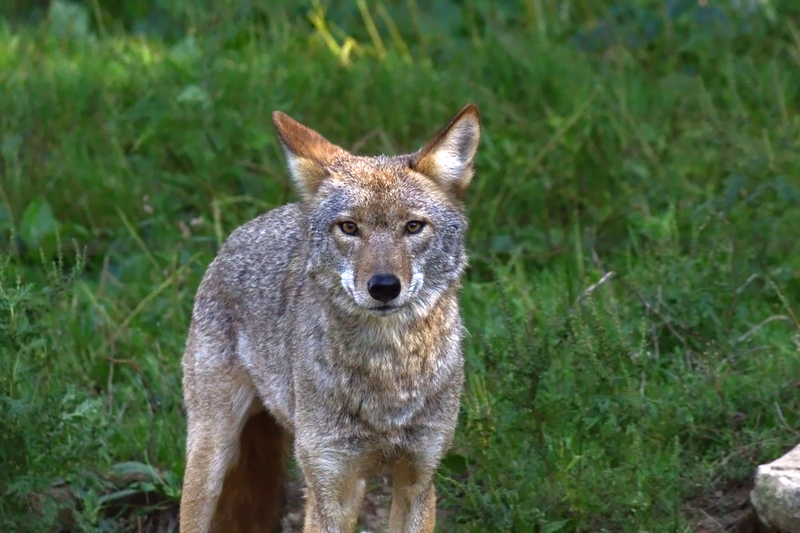 While coyotes are less likely to attack a medium-large dog or a human, they do readily prey on small dogs and cats. Marine City, MI, pet owners, Kim and Brent Shacklett, can attest to the risk of a coyote-pet encounter. Their dog, Allie, was recently attacked. Allie, a 9-pound Yorkie Poo, was standing beside Kim in their yard early in the morning. Their house and yard are surrounded by long grass on their 8-acre lot. Outside the range of their yard light, in the outer area of the yard, Kim saw something that she thought might be a deer. As soon as the coyote got Allie in the long grass, it grabbed around her upper back and shook her. Kim yelled and came at the coyote until it dropped Allie. When they got to safety, little Allie had serious external injuries and internal trauma that required the intervention of OVRS’ critical care team. Her muscle tissue was shredded down to her rib cage. 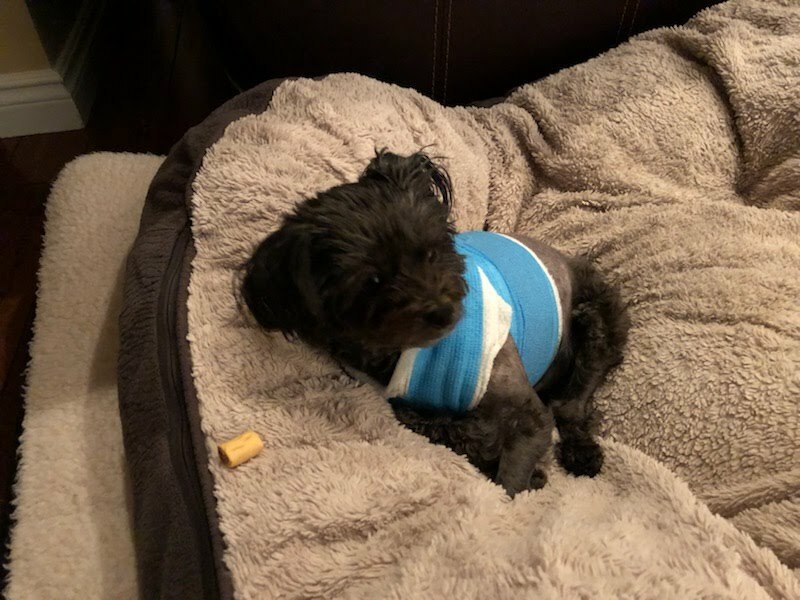 The events that Allie and her pet parents faced is a harrowing scenario, but one that gives other pet parents insight into why education and prevention are essential. Learn about coyotes and their behavior and what to do if you encounter one. Coyotes often send one coyote to engage with a dog, then playfully lure the dog away from the house until the pack can surround the dog. Kim had thought a coyote would run at a dog. Keep your pet on a leash, unless in a well-fenced backyard, and supervise them when outdoors. Coyotes can hop atop an 8-foot concrete wall. Bring pets in after dark, and consider keeping your outdoor cat inside at all times. If you encounter a coyote, use this simple hazing technique. Cut down overgrown areas and weeds where coyotes or other animals may hide. Consider a product like CoyoteWhiskers if your pet is at higher risk temporarily, such as on a hike or while camping. Kim says that the family has lived on their property for over 20 years and have seen coyotes in the fields but never had an issue until the day Allie was attacked. She warns, “Don’t assume they won’t attack or take them for granted. It only took an instant and we would have lost Allie had I not been there.” Since the attack, Brent and Kim have installed cameras, catching multiple sightings of coyotes in the yard at night and in the morning. There is a place and need for all animals, including coyotes, that contribute to a healthy ecosystem. To better protect your pet, get to know more about coyotes and use measures to keep your furry loved one safely co-existing alongside them. For additional information about coexisting with coyotes, feel free to give us a call. Our goal is to help you better understand coyotes, and how they interact with small animals, so that our pets can more safely live alongside them.